Ok, so I rescued this from a friend who has not looked after it at all. Unfortunately, as you'll see from the pictures, it's not in great condition in terms of wear to the frame. There are no dents or scratches. I've relaid some decent bar tape and put on plugs, ferrules and made the brakes work again but a full restoration is not something I want to do, so I'm selling. 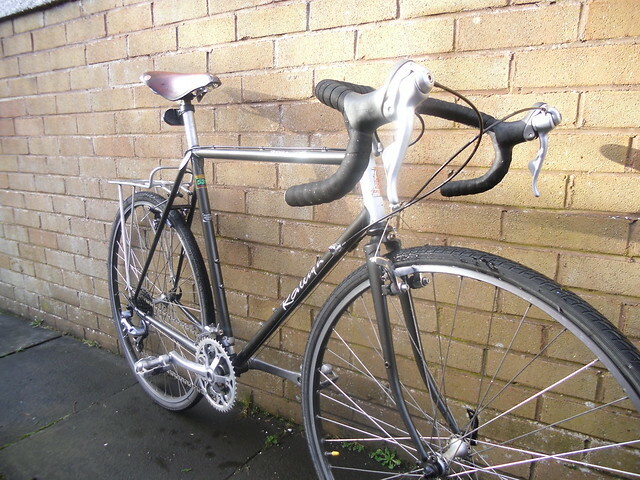 It's a Raleigh Randonneur, handbuilt in England, a Reynolds 531 super tourist frame around 53cm. Has Mavic wheels, Shimano deore gearing and 105 brake levers with frame mounted shifters and a Biospace triple chainset. Also has a Brooks saddle. It's not been well looked after, some rusted patches on the forks where paint has come off and a few patches on the frame. Rideable condition but needs a restoration. Still has spare spokes on one of the stays. Given that this is a fairly rare bike, and that any buyer is likely to be restoring, I would like £250 for this. Item is in Bristol, pick up would be preferred. Pics to follow cos I can't post links and the attachment thing isn't working! Last edited by Deketh on Wed Sep 19, 2012 3:29 pm, edited 2 times in total. Excuse the picture quality, my camera is awful. A very honest description and a very honest price to go with.. pitty it's not my size otherwise i'd have had it off you in a heartbeat. Looks like a 1991 and is one of all time favorite bikes with the equivalent nowadays costing upwards of 1000, so well worth putting the money in. Thanks. Just out of curiosity, what's your size? I had a 57cm, sold it and have regretted it ever since so have been looking to buy another one for a while. The do pop up on ebay from time to time in various states if condition and tend to go for anything from 450 to 650. Frequently they'll be in "as new condition". I guess a 56 is just too small then? That's a shame. That looks nice with those shifters! I don't think they made a 56, not according to the brochures I have anyway. The one you are selling looks quite small, or atleast the head tube does anyway. Oh right. Am I measuring the wrong part? That 56 was for the top tube. Yeah, usually people go from the centre of the bottom bracket to the top of the top tube.